A very hungry caterpillar that devours hedges has been named "top pest" by the Royal Horticultural Society. The box tree caterpillar - the larva of a moth - is native to Asia and feeds on box plants, commonly used in formal gardens for hedges and shrubbery. First found in the UK in 2011, it was initially limited to London but is now spreading across south-east England. It is the first time in nearly a decade that slugs and snails are not top of the society's most-unwanted list. The list is based on the enquiries about pests received by the Royal Horticultural Society (RHS) entomology team (insect experts) in 2015, of which the box tree caterpillar accounted for 433 (17%). Box tree caterpillars (Diaphania perspectalis) feed within webbing and can completely defoliate box (Buxus) plants. The moths lay overlapping sheets of pale yellow eggs on the underside of box leaves. Once hatched, the larvae begin chomping their way through their host plant. Reaching around 4cm long, they spin webs around leaves and twigs to conceal and protect themselves. 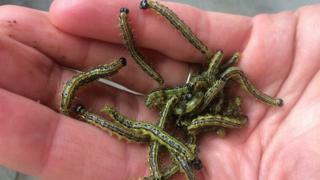 The RHS says gardeners can physically remove the caterpillars by hand or use a biological control or insecticide. While the adult moth was first reported in the UK in 2008, caterpillars were not found in private gardens until 2011. By the end of 2014 the moth had become established in parts of London and surrounding counties. Experts believe the moth originated in China and either flew across the English Channel or stowed away in containers of imported plants. However, the caterpillar has nothing to do with the disease known as box blight, caused by a fungus that attacks plants, leaving them with bare patches and dieback - a condition where it dies from the tip of its leaves backwards. Last year was a bad year for box plants, as box blight was one of the most commonly reported garden diseases, the RHS said. Box blight poses a serious risk to UK horticultural heritage as box plants provide the structure of many historic formal gardens, according to experts. The experts said high temperatures and rainfall in the spring led to a spike in enquiries about box blight as the weather created perfect conditions for the disease. And the warmest, wettest December on record meant there was an unexpected rise in enquiries about the disease when it would normally be suppressed by cold conditions.